This busy Switzerland tour by train starts in Lucerne, the heart of Switzerland, then takes you to the Italian speaking Lugano and via the Bernina Express scenic train to St. Moritz in the Engadin. Next you will transfer on the famous Glacier Express to Zermatt to see the Matterhorn. After visiting Montreux you continue with the Golden Pass train to Interlaken for an excursion up to Mt. Jungfrau (Top of Europe). This package includes all rail transportation, overnights in 3 or 4-star hotels with breakfast, seat reservations on Bernina Express, Glacier Express and Golden Pass and the excursion to Mt. Jungfrau. This Swiss rail journey starts any day between April 1 and October 13, 2019. Swiss rail journey in 2nd class from Zurich Airport via Lucerne to Interlaken. Overnight in Interlaken. After breakfast a highlight of your Switzerland tour by train awaits you. Enjoy a Swiss rail journey to the Jungfraujoch – Top of Europe. Overnight in Interlaken. Train ride to Zweisimmen. Change to the GoldenPass Panoramic train (or optional GoldenPass Classic) for this memorable trip to Montreux on the shore of Lake Geneva. You find yourself among alpine forests, bubbling mountain springs and picturesque mountain villages. Overnight in Montreux. Today you board the train to Zermatt, the marvellous and famous car-free alpine resort at the foot of the majestic Matterhorn. Optional excursion by cogwheel railway up to the Gornergrat where you will have a superb panoramic view of the Matterhorn, Mont Blanc and other snow-capped peaks rising to above 4000 m/13’000 ft. or experience the peak of sporting adventures in the Matterhorn glacier paradise. At an airy 3883 metres of altitude you will find Europe’s highest aerial cableway and summit station. If you want to go higher, the summit lift brings you up to the viewing platform with a 360° panoramic view. Overnight in Zermatt. Today you board the Glacier Express for one of the greatest Swiss rail journeys in the world. You travel from St.Moritz to Zermatt. An 8 hour railway journey across 291 bridges, through 91 tunnels and across the Oberalp Pass at 2’033 metres in altitude. Travel in comfort through the unspoilt natural beauty of a landscape rich in ancient, fragrant mountain forests, peaceful Alpine meadows, rushing mountain streams and mountain valleys, soaked in tradition and centuries-old culture. Optional lunch – if required, please indicate on the booking request. Overnight in St. Moritz. Today you travel with the Bernina Express of the Rhaetian Railway along the UNESCO World Heritage route. Enjoy an Alpine switchback ride, taking you from the high, towering glaciers of the mountains down to the swaying palms of Italy: the Bernina Express is the highest railway line across the Alps, linking Northern and Southern Europe – and this in the most spectacular way! Overnight in Lugano. 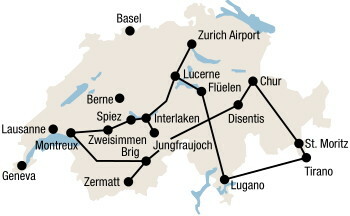 Continue the Swiss rail journey from Lugano to Lucerne. Experience the new Gotthard Base Tunnel – with 57 kilometres it is the longest Switzerland tour by train tunnel in the world. It takes only 17 minutes to travel this fast flat-track route under the Alpine massif in the heart of Europe. Rest of the day at leisure in Lucerne. Overnight in Lucerne. This tour can also be booked in the opposite direction. Swiss Transfer Ticket Combi: Grand Train Tour of Switzerland (8 transfers) incl. excursion to Jungfraujoch in 2nd class from/to Swiss border or airport. 2 nights in Interlaken, standard room with private facilities, breakfast. 1 night each in Montreux, Zermatt, St. Moritz, Lugano, Lucerne, standard room with private facilities, breakfast. Seat reservation GoldenPass (Interlaken – Montreux), Glacier Express, Bernina Express. For train and coach. Any additional tickets for optional excursions to travel by rail, boat, postal-coaches and cable cars can be purchased at 25 – 50% of the regular fares. Some hotels may charge a local city tax on spot: app. CHF 2 to 7 per person/night. Board the Gotthard Panorama Express from Lugano to Flüelen and travel along the Gotthard mountain panorama route followed by a lake cruise to Lucerne. In the panorama railcar passengers will be accompanied by a travel guide and will be entertained with special effects and additional information of the region, its many sights, mythology and mystique. NEW: the Gotthard Panorama Express from Lugano to Flüelen will operate only as a 1st class panoramic train offering all guests seats with panoramic windows. 2nd class will no longer be offered on the train. The highest railway station in Europe is located at 3454 m/11’333 ft. Visitors gain access to a high-Alpine wonderland of ice, snow and rock, which they can admire from the viewing platforms on the Aletsch Glacier or in the Ice Palace. The railway journey to the Jungfraujoch is an experience which leads through the mountains Eiger and Mönch. From the intermediate stations Eismeer and Eigernordwand visitors have stunning views of the impressive Eiger North Face.